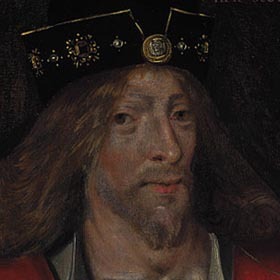 JAMES I., KING of SCOTLAND (1394-1437). —Poet, the third son of Robert III., was born at Dunfermline. In 1406 he was sent for safety and education to France, but on the voyage was taken prisoner by an English ship, and conveyed to England, where until 1824 he remained confined in various places, but chiefly in the Tower of London. He was then ransomed and, after his marriage to Lady Jane or Joan Beaufort, daughter of the Duke of Somerset, and the heroine of The King's Quhair (or Book), crowned at Scone. While in England he had been carefully educated, and on his return to his native country endeavoured to reduce its turbulent nobility to due subjection, and to introduce various reforms. His efforts, however, which do not appear to have been always marked by prudence, ended disastrously in his assassination in the monastery of the Black Friars, Perth, in February, 1437. James was a man of great natural capacity both intellectual and practical—an ardent student and a poet of no mean order. In addition to The King's Quhair, one of the finest love poems in existence, and A Ballad of Good Counsel, which are very generally attributed to him, he has been more doubtfully credited with Peeblis to the Play and Christis Kirke on the Greene.